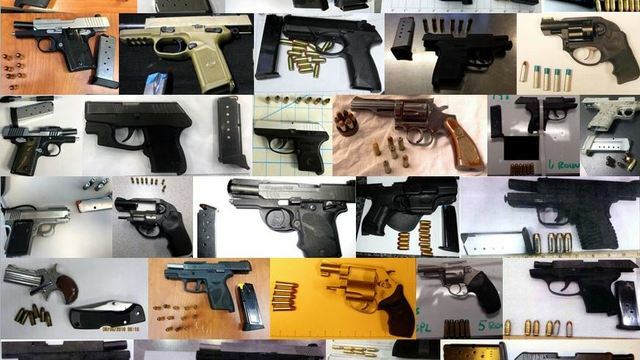 According to reports by WSBT, the Transportation Security Administration (TSA) found a record-breaking amount of firearms at airports across America. The alarming number of guns discovered this week beat out a previous record, from May of 2016, of 74 firearms. In addition to the 78 guns, there were a few other items that did not make it through the security check either. Four inert replica grenades were also discovered this week, along with a cane sword and a knife concealed in a bottle of pills, according to a post on the TSA blog. Always remember to check the gun possession laws in each state you are traveling to, because the laws vary by state. Failure to do so could result in large citations or penalties. Security line delays are caused each time the TSA finds a dangerous item. Passengers can be given a citation or in some cases, arrested. The passenger can face a penalty as high as $11,000. The TSA offers tips on traveling safely with firearms and ammunition. This does not mean you cannot take your guns with you. However, in order to avoid biting the bullet of TSA’s wrath, make sure you have properly done your research. Previous ArticleIs the LGBT Community Targeting Gun Rights Next?